It's possible to do it all at once.........or to break it up over time. There are pros and cons to each! ....is more efficient, you get really in the zone, and sometimes adrenaline fuels quicker working. ....means the effort is less intense, you have time to catch important details, you can rest in between. Either way, it's helpful to know early how you're going to file, so that you can line up any help, or make appointments. (For example, if you're planning to go to H&R Block, you'll need to find their open hours. If you're hoping to work with an accountant, they'll have their own deadlines for you, earlier than April 17th!) Click here to read more about options for filing. I've broken up the process into several steps, which can be spread over days/weeks, or done all at once. More details about each step below. Please keep in mind: as a project manager client once explained to me.......when you break things into many steps, each step looks easier, but then, you have a lot of steps! Don't let this discourage you. Just find a way to start, and, in theory, each step should feel easy and quick, and you'll build momentum. It can look like a lot! And feel like a pain! It can also be very rewarding, and I'm determined to help you build in some fun. Warming up ... okay, so you don't have to, but it will make things more pleasant. It's like stretching before playing soccer, or better yet, like a cocktail + appetizer before dinner! As part of our Tax Prep, Warming Up includes picking a due date, your option for filing, considering your way of working, putting time on the calendar, and most importantly...........finding ways to make it fun and picking rewards! Click on the image to get a downloadable PDF. You might notice that I often refer to inviting a friend to join you for some of this work. I'm not kidding about this! If you make an appointment with a friend, you're more likely to do the work (not put it off), it's way more more fun, it can go faster, and they can help you figure out anything confusing. Most often, friends are happy to lend a hand in exchange for dinner, a bottle of wine, a candle, or just some sincere thanks. Do you have someone who could keep you company with this? I love this step. Can you tell? Here's why. Every receipt you find for business expenses is like finding $$$$$! Depending on your specific tax scenario...for each receipt, you'll be saving 20 - 30% of what that receipt is worth. For example, if you bought a few books for your business, and the cost totaled $80...then you'll pay $16 - $24 less in taxes. With this step, we're just collecting stuff. No adding, no smoothing receipts, just find it. ProTip: create a spot somewhere to put all these things, or perhaps a very pretty basket, or decorated office box. So.........you don't pay too much! >>> If you know what to do, or would like to just figure it out as you go, print the Calculate-Basic sheet and start filling in numbers. 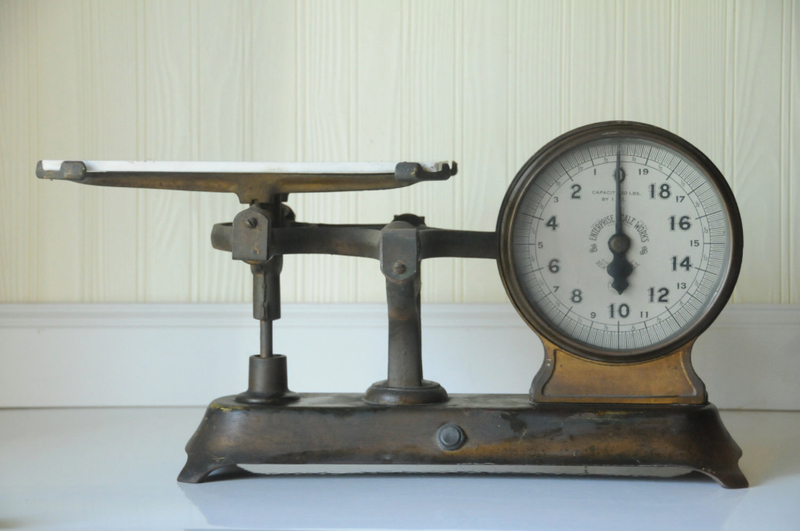 Before we talk about the numbers we need, let's review why we have to do all this work. Basically, it's so that you don't pay too many taxes! The IRS taxes you on your Income. When you are a sole proprietor or single-member LLC, the profit from your business is considered your income. Two of those numbers (gross sales and expenses) are made up from several other numbers, and have to be reported in the right way. The IRS created the form Schedule C for sole proprietors and single-member LLCs. The worksheets I created are simplified versions of the Schedule C.
In this step, the idea is to find these numbers. It's possible you have them already if you've been keeping records, or using a program such as QuickBooks. If you still need to calculate your totals, and would like some guidance, click here to read more about this. There are several ways to do this! Just a few include: pen and paper, spreadsheets, and software. Find what works best for you, and consider getting a friend to help. Congrats! You've finished the CALCULATE step, often the longest one. By any chance, did you discover that you were missing some things? Or did you have new questions as a result of your work? That's super normal! That's what the Check + Find is about: finding missing things, getting answers, and double-checking your math. This step is optional. It's offered for those of you who like to be very thorough before filing. This checklist prompts you to check the math you've done so far (income subtotals, expense totals, mileage). There's space to list questions and things to find. Use it to keep track of your progress. It's finally here, the big moment. • Filing Online - TurboTax, H&R Block, TaxAct, etc. Each checklist covers the basics that are related to Self-Employment—Schedule C, SE, and a few lines on the 1040. 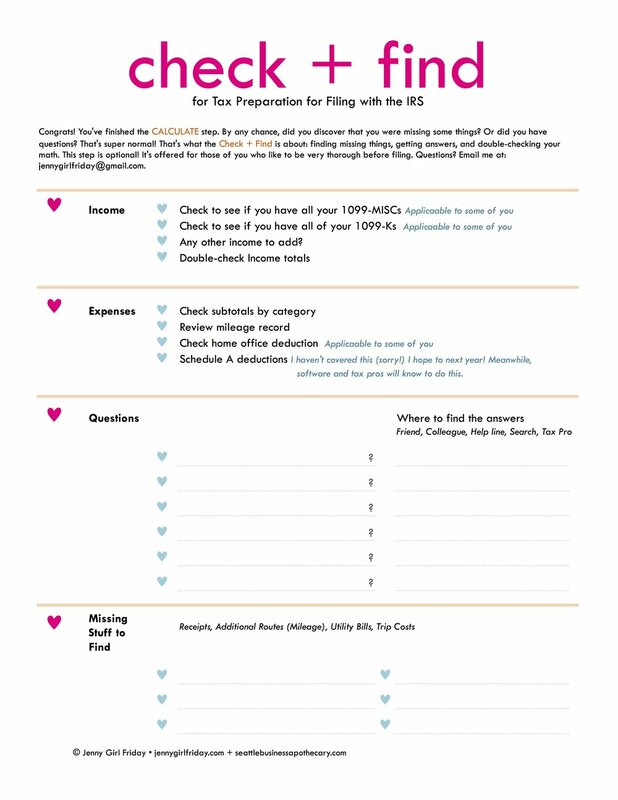 The checklists do NOT include steps to complete the entire 1040 form. It's possible that you might have a few additional details to add, or issues to explore. Hopefully, getting the basics all done will make it easier to figure out the rest. ♥ They might look long, but don't worry too much! They only look long because I wrote out each little step separately. ♥ Remember to get a friend to keep you company, and/or make the job fun with things like favorite music, treats, a show in the background. ♥ Also, when you're finished with this step, be sure to give yourself the reward you identified! It's common to be too tired and relived to care, and to skip the reward. Please don't! You deserve it. Phew! You're almost done. There's just one last crucial step - to Store everything away. You might be thinking, I'm over this! I'm done! I get it, that's super reasonable....and I promise, this last step is worth it and feels really, really good. It's your choice: you can shove papers in an envelope or file willy nilly. Or, put things in place...neatly, and methodically. Either way, you'll feel so much satisfaction, relief, and closure. And, if ever in the future, you do need these documents, you'll be SO glad that you did this. As usual, I invite you to add a reward for this step, even though it's not on the checklist! Hopefully, you already did this. If not, now's your second chance. Also, right now, fresh off the job, is the BEST time to make a change or two, to make life easier next tax season, and throughout the year. Do your future self a big favor by taking just 5 - 10 minutes to reflect!